Most babies love being held, even beyond the fourth trimester. However, if you've got older siblings and stuff to do, sometimes it's not practical to be a one-armed superwoman. Or maybe, you have dogs that need walking on terrain that's not really suitable for a pram or buggy. That's where babywearing can be an absolute life saver. This week is International Babywearing Week, which aims to "celebrate, promote, advocate for, and focus media attention on the many benefits of babywearing". 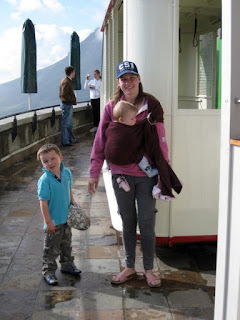 With my eldest, while the benefits of babywearing were obvious, I wasn't sold: I had been given a high street carrier that was a faff to put on, was uncomfortable for me and which my son outgrew in a matter of weeks because he was just too chunky and the shoulder straps dug into him. It was only with my daughter that I discovered the myriad of babywearing options out there and really got into the babywearing scene. If, like me, you are confused by all the options, here's a rundown of the different baby carriers and slings available. The best place to start is by looking up your local sling library or sling meet where you can try out a few options and ask questions from babywearing experts. Who will be using the baby carrier? Is it just you, or will your partner or another care giver also be using the sling? When will you be using it? Will you be wearing your baby all day? Will you be out in all weathers or are you just planning to use it for the school run? Do you need to breastfeed in it? How long will you be babywearing? What age is your child? Will you just be wearing your baby while he or she is an infant or will you continue until they are nearer pre-school age? 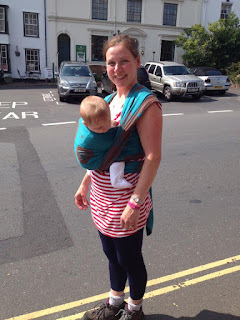 How will you carry the sling when you are not breastfeeding? Do you need something that can fold up into your change bag or is size not an issue? What size are you? Are you tall, short, slight or larger? You'll need a sling that is comfortable and supports your back as your baby gets bigger and heavier. What's the weather like? If you're in a hot climate, you'd be better off with a lightweight fabric like cotton, whereas if you live in a cooler climate, you might be better off with a thicker fabric. If you want a carrier that's fairly easy to put on and can be easily adjusted between you and another care giver, you might want to look at a buckle carrier. These are the easiest to find on the high street or you can visit a specialist retailer. Look for a carrier with a wider base to support your baby's hips. You want baby's legs to sit in an 'M' shape rather than to just dangle. Although some carriers are built for baby to face either you or out to the world, it's generally recommended to have them facing you as this position is better for their backs and prevents them from being over-stimulated. Popular makes include: Beco, Connecta, Emei Baby, Ergo, Manduca and Rose & Rebellion. These are similar to buckle carriers, but the shoulder straps are fastened by tying a knot in the straps and the waist is fastened with a buckle. A Mei Tai carrier has a similar body to a buckle carrier, but is fastened by tying long fabric straps rather than with a buckle. This means it's easy to adjust the carrier to fit your size and means it can easily be shared with another care giver. Popular makes include: Babyhawk, Kozy, and Palm & Pond. These are ideal for newborns and infants. They are a length of stretchy material that you tie around you in a variety of different ways. Stretch wraps are ideal for supporting baby while leaving your hands free to get on with life and it's easy to reposition baby to feed while wearing them. The bonus with a stretchy wrap is that you can pre-tie it around you before placing baby inside. Popular makes include: Calin Bleu, Je Porte Mon Bebe (JPMBB) and Moby. These are a length of woven material, available in different lengths, that enable you to achieve a range of different carries by tying the material around you and your baby. Woven wraps are incredibly versatile and suitable for front or back carries and for all ages of child. It can take a bit of practice to get the hang of wrapping, but there are plenty of YouTube videos that show you how to achieve the different styles. Woven wraps are ideal for longer-term use, the only drawback is that it can be difficult to tie them in the rain without getting the ends wet. Popular makes include: Didymos, Girasol, Kokadi, Lenny Lamb and Oscha. Ring slings are great for popping in your change bag and for quick carries, such as getting from the car to do the school run or, for an older child, when they tire of walking. They are a length of material with two rings attached that you wear over one shoulder and then simply tighten the material through the rings. 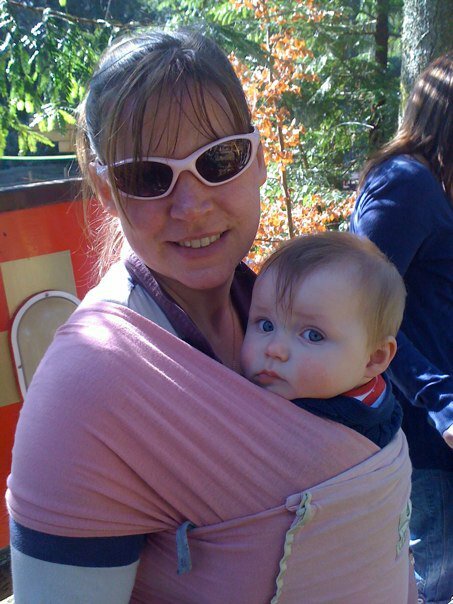 Ring slings are suitable for any age and easily adjustable for different wearers. However, because all the weight is on one shoulder, they're not ideal for wearing on long walks. Popular makes include: Didymos, Girasol, Lenny Lamb and Little Frog. Some people have been put off babywearing after hearing tragic stories of babies being suffocated while in a sling. However, if you use a bit of common sense and follow the simple, TICKS babywearing guidelines, the risks are minimised and you and your baby will benefit from an increased bond and an ability to get on with everything life throws at you with both hands available! T - Tight: Ensure your sling or carrier is tight enough to hold your baby close. You don't want any slack or loose fabric that could mean your baby slumps down in the carrier and potentially could hinder their ability to breathe. I - In view at all times. You should be able to see your baby's face. Not only does this help with your bond, but it means you can easily check on their wellbeing. C - Close enough to kiss. Your baby's head should be close enough to your chin that you can easily bend forward to kiss them. K - Keep baby's chin off their chest, so their airway is unrestricted. S - Supported. Baby's back should be supported so their tummy and chest rest against yours. Over the years, I've tried a few baby carriers and I currently have three: a ring sling I made myself; a Beco buckle carrier; and a Kokadi Frog Prince woven wrap. I like having the versatility of choosing a carrier for different circumstances. For the school run, I favour the ring sling, while for longer days out I prefer the buckle or the wrap. What baby carrier do you have and why?